Round 3 of the Dirt Series took place at Milestone MX Park in Riverside, California. The Rockstar Energy / Polaris UTV Wolfpack earned another pair of 1st and 3rd place finishes to continue the streak of multiple podiums. Bryan Carr and Jason Merrell were representing while teammates Jeremy Merrell and Jordan Cochrum had their Polaris UTVs on display in Lake Elsinore at the Lucas Oil Off Road Races during the Rockstar Energy So-Cal Nationals. Dirt Entertainment also known as the Dirt Series of Racing has grown rapidly in popularity over the past two years. The UTV SxS racing has really blown up attracting insane crowds to the track. Jason Merrell explained, “The Dirt Series is a lot fun of fun because they build exciting courses that make for action packed racing. 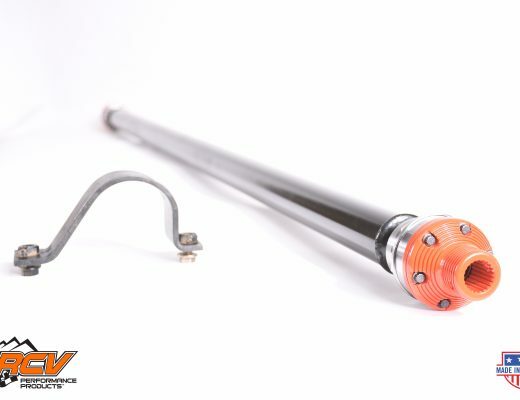 Originally constructed for quads and dirt bikes, they just make a few adjustments for the SxS UTVs and than figure out the best approach, jumps and landings. It’s almost just like riding a dirt bike. These jumps are not forgiving as we had seen a car go end-over-end and another car fly off a jump and hit a telephone pole. We have full confidence in the safety of our metal cages because the cars were built by Carr One Fabrication out of Lake Elsinore. The cars that we are seeing race on the regular are super fast and getting big air. The back table top step up was the best jump on the track hitting the face wide open and utilizing the mixture of Walker Evans Shocks and the throttle to keep the car level was tricky. It’s amazing what these Polaris RZR XP 900‘s get put through in a race and still hold up to the constant abuse.” The gate line up for Production 1000 Class was a large and highly competitive field. Bryan Carr from Carr One Fabrication got his machine in the top four off the gate start. But after a few laps into it, Bryan worked his Polaris into the top position. Bryan said the jumps were fun and thanks to our Walker Evans Shocks it made the difference between clearing the jumps perfect and having to roll over them. 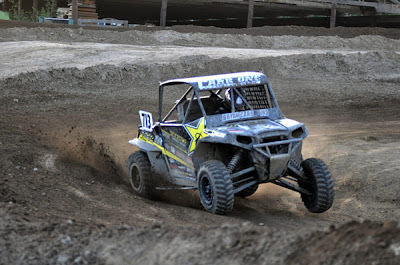 As his Polaris RZR XP pulled him around the track Bryan Would finish in 1st place and is currently the points leader for the production class. The UTV Unlimited division featured the bigger motor cars. Jason Merrell of the Rockstar Energy / Polaris UTV Wolfpack entered his stock 900 XP and was able to get a great start with the FMF Exhuast system and Sun F tires hooking up he shot straight to the corner. Merrell was just closed out and blocked by two Can Am machines in an aggressive defense; neither car let off or gave any ground. Jason not wanting to damage his Polaris settled in to hunt down the front runners looking for a clean passing opportunity. As the race went on under the lights, it seemed the track was a lot faster than earlier in the day. The heat race was problematic as the sun was setting on one side of the track and made it near impossible to see the jumps. Jason went onto finish 3rd place for the main race to secure 3rd place overall on the day. Rockstar Energy, Polaris Offroad Vehicles, Carr One Fabrication, BPG Shredder, UTV Underground, Lucas Oil, MAVTV, Makita Power Tools, Walker Evans Shocks, FMF Exhuast, Rugged Radios, Impact Race Products, Desert Molding Concpets, GPS Offroad, Sun-F Tires, Hiper Wheels, XS Power, Eclipse Recreational RV’s, Summers Bros Racing, Liquid Graphics, Merrell Media, Replay Cameras, Rockwell Watches, Loctite, Coast Motoring, Approved Memory, Proline Wraps, Sound Stream Audio.